EML, Bangor Savings Bank and PayWith announce the launch of a revolutionary program that merges payment, loyalty, rewards and gift functionality into a mobile app and a single card. The EML solution merges payment, loyalty, rewards and gift functionality into a mobile app and a single card. The program is a perfect example of how EML is innovating payment technology across North America, Europe and Australia. EML Payments USA, LLC, a wholly-owned subsidiary of EML Payments Limited (ASX: EML), in conjunction with PayWith Worldwide, Inc. (PayWith), is pleased to announce the launch of a pioneering community rewards program for Bangor Savings Bank (BSB), called Buoy Local® Community Program. The program merges payment, loyalty, rewards and gift functionality into a mobile app and a single card. BSB is one of the largest community banks in Northern New England with 54 locations in Maine and New Hampshire. EML and PayWith worked with BSB to develop a unique, all-in-one loyalty solution to reward Buoy Local® App users for shopping within a “coalition” of local, independent businesses. The solution links PayWith’s proprietary, digital rewards platform and mobile app to EML’s payment card processing capabilities. The result is a comprehensive solution that empowers local merchants to present digital offers to Buoy Local® App users for instant, on-site redemption. Together, EML and PayWith technologies are helping BSB evolve their existing Buoy Local® Gift Card into a multi-functional rewards program. The new program will enable cardholders to link their Buoy Local® Gift Card and a BSB debit card as funding sources in the mobile app. Customers can earn reward points by shopping or dining at participating local merchants, and then redeem reward points and merchant offers in real-time at the point-of-sale, at any merchant within the coalition. The new Buoy Local® Community Program includes participating locally owned businesses in Bangor, Portland, and Belfast, and will grow to include local businesses throughout Maine in the upcoming months. With payment solutions from EML, you will be empowered with more control, transparency and flexibility over your payment processes. Our combined portfolio offers innovative payment technology solutions for payouts, gifts, incentives and rewards, and supplier payments. Together, we issue mobile, virtual and physical card solutions to some of the largest corporate brands around the world, process billions of dollars in payments each year, and manage more than 850 programs across Australia, Europe and North America. Learn more at http://www.EMLpayments.com. PayWith Worldwide Inc. is focused on making card programs better. We deliver relevant real-time rewards and benefits to consumers. We connect consumers to bricks and mortar businesses; bringing accountability to the world of advertising. We develop enterprise-grade solutions that integrate mobile communications, payment processing, real-time data and analytics to enrich consumer experiences. Working with organizations who have existing card programs in market we turn their traditional cards into advanced, mobile-centric marketing and communications tools that engage their customers to transact and spend more frequently. Currently, we provide innovative solutions in the United States, Australia and Canada. For more information, please visit http://www.paywith.com. Bangor Savings Bank, with more than $3.7 billion in assets, offers retail banking to consumers as well as comprehensive commercial, corporate, payroll administration, merchant services, and small business banking services to businesses. The Bank, founded in 1852, is in its 166th year, with 55 branches and on the Web at http://www.bangor.com. The Bangor Savings Bank Foundation was created in 1997. Together, the Bank and its Foundation invests over $1 million into communities in the form of nonprofit sponsorships, grants and partnership initiatives. The Buoy Local® Community Program is based on the “buy local” concept of shopping independently owned businesses within local communities. 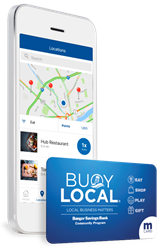 The Buoy Local program delivers contemporary mobile engagement and loyalty technologies to help meet the unique needs of participating businesses. The Buoy Local® Gift Card is accepted only at participating, locally owned shops, restaurants and businesses around Maine. Bangor Savings Bank customers can buy a Buoy Local® Gift Card via their ecommerce website, or at participating Bangor Savings Bank branches. Maine businesses can sign up to participate in the program by visiting http://www.buoylocal.com. The Buoy Local Gift Card is issued by MetaBank®, Member FDIC. MetaBank is issuer of the card only and does not endorse or sponsor the optional rewards program.